An ASWC email sent out September 8 announced that Whitman’s policy committees have been consolidated to three more broadly defined advisory groups. The email sought student representatives for the three committees: Whitman Experience, Whitman Resources and Whitman Advancement. 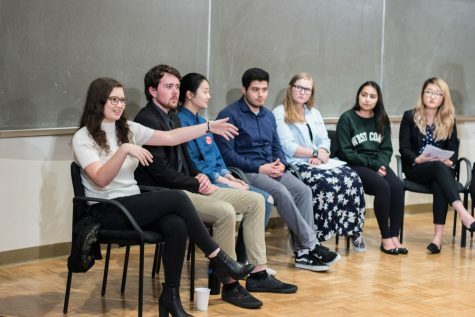 Each committee has 10 members, including one student and one faculty representative, a marked decrease from the past, when larger committees allowed for more representatives from each group. Under the new structure, fewer committees with less members will meet for longer periods of time. Additionally, while in the past committees were observed by rotating overseers who would sit in from time to time, the committees are now largely left to their own devices as the overseers now make up a more structured Presidential Advisory Committee. The change was likely overdue, as the size of the committee was sometimes inhibitive to productivity. “This is part of a bigger strategic plan to get more done, to have these committees actually be coming up with ideas and implementing them rather than sitting in the back and discussing,” McCorvie said. In this streamlining, the number of student representatives has decreased. Previously, twelve students in total sat on the scattered committees. That number has now decreased three-fold. Citing this decrease in student voice, ASWC approached administration after the announcement and managed to secure a non-voting student position on the Board of Trustees, an unprecedented development. “I’m certainly disappointed that we dropped from 12 to four students, but I think one thing we can look to is faculty. There will be one faculty member on each of these committees as well, and then the elected chair of the faculty, Melissa Clearfield, sits on the cabinet. They have a very similar model to us,” McCorvie said. However, though ASWC was not involved in the decision to restructure, it may actually be a positive development for the expression of both student and faculty opinion. “Though it is true that there are literally less faculty involved in the committee process in this new structure, I think it will actually benefit the faculty. The longer sessions and smaller groups mean that faculty will get the chance to really articulate their points to the trustees,” Clearfield said. For their part, the Board of Trustees also expects increased productivity. Chair of the Board Brad McMurchie also expects the smaller group sizes to provide greater individual opportunity. The Board made the decision while forming the college’s strategic priorities, and the two are unsurprisingly intertwined. “The policy committees of the board will be working to assess how we will measure success relative to our strategic priorities. We will then be working collaboratively with the administration, faculty and students to determine the tactics most likely to lead to this success,” said McMurchie over email.